Many other sizes and combinations are available - contact Air-Dock for more information. Sizes shown above are approximate, actual sizes are best detrmined using "water width" measurements and considering height. 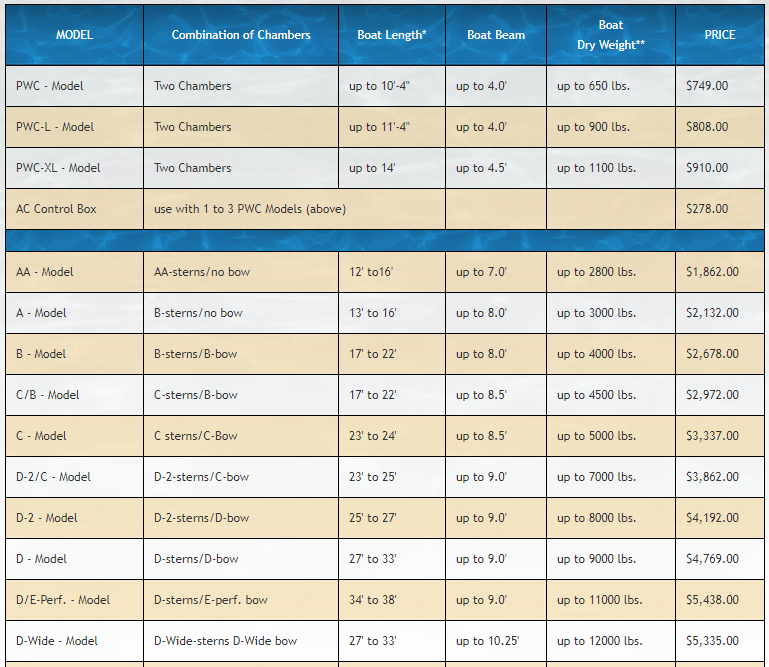 Other combinations and custom sizes may be available for boat sizes not shown above. All Air-Dock boatlifts above (exept PWC Model) include a 110 volt AC blower and control box. *boat length is measured from the transom to the bow NOT including swim platforms, outboards, bow pulpits, anchors, etc..
**boat dry weight is the dry weight as per the manufacturers specifications NOT including fuel, water, people and cargo. All models, specifications, and prices subject to change without notice. 20% restocking charge on unused merchandise returned within 30 days.